One of the most prolific lawyers of our time, Alan Dershowitz joins the Gold Tone podcast and talks about his career, some of the higher profile cases and clients (including one who nearly choked him to death). He also shares insights about his latest book about the 2016 Presidential election…. Iconic boxing legend George Foreman joins the Gold Tone crew with wit, wisdom, and insights for young athletes and entrepreneurs. He also talks about his new show on NBC traveling alongside William Shatner, Terry Bradshaw, and Henry Winkler. Click HERE to download the podcast on Soundcloud. Les, Seth, and Sarah talk to Ken Shamrock, one of the original UFC fighters and the “World’s Most Dangerous Man” about his career and what he thinks about the UFC being sold for 4 billion dollars. Click HERE to download the podcast on Soundcloud. 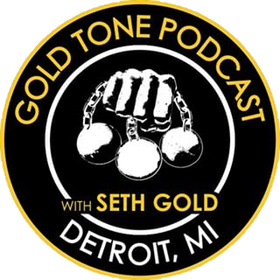 Seth Gold is a pawnbroker and reality television personality whose family owns and operates American Jewelry and Loan in Detroit, Michigan, USA.